SPUR’s Allison Arieff, Nicholas de Monchaux, Nataly Gattegno, and Craig Cannon discussed the future of cities at SPUR. Photo: Streetsblog. 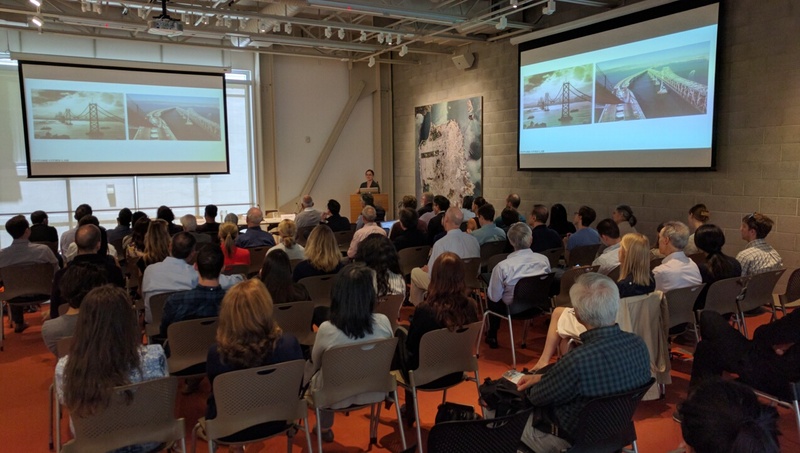 Monday afternoon the San Francisco Bay Area Planning and Urban Research Association (SPUR) hosted a lunch-time talk entitled “Designing For What We Don’t Know Yet,” that discussed architectural and design concepts for workplaces of the future. 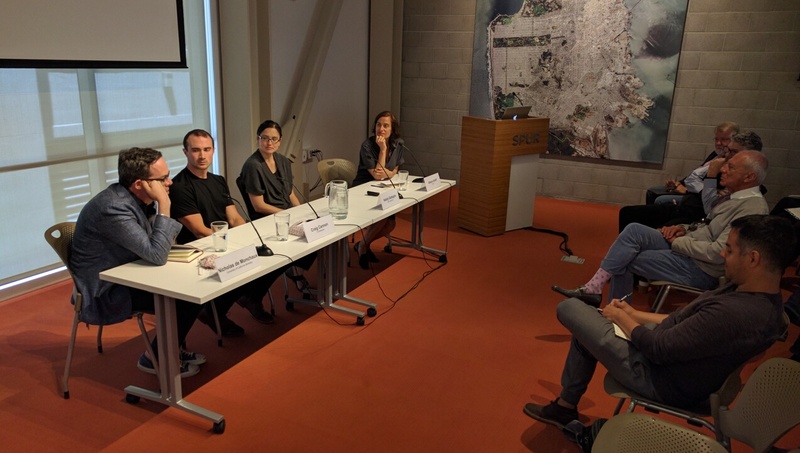 Some 80 people attended the panel at SPUR’s Mission Street headquarters, which covered concepts ranging from building offices on and above water, to the influence of George Lucas and Star Wars on modern design. Under this vision, transportation would be re-oriented as well. Ferries and small boats would travel right up to the buildings and take workers to and from all over the Bay Area. “We could design our architecture to actually thrive in a watery environment,” she said. She also talked about a fanciful proposal to use the old Bay Bridge span for housing and offices. “With pods suspended beneath on hoists that would go up and down to the water for transportation connections,” she explained. The Hydramax proposal envisions buildings on piers jutting into the San Francisco Bay. Image: Future Cities Lab. This doesn’t mean, he explained, that people simply stay in bed. He cited Burning Man as evidence that when people have enough money to meet their basic needs, instead of working they often decide to create projects to find meaning. That too, the panelists explained, can have a profound influence on how cities are designed. 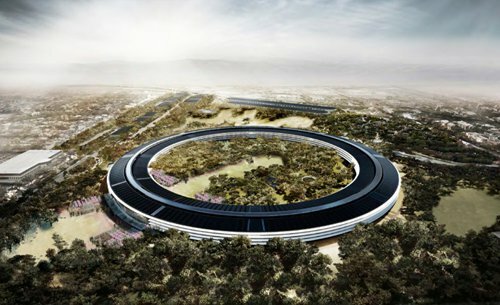 A rendering of Apple’s new “space ship” headquarters in Cupertino. From the SPUR presentation. Nataly Gattegno of Future Cities Lab talks about offices and homes built over the Bay. Photo: Streetsblog. I’d rather see time and energy spent on Cities of Today. There are a host of problems that have gone unattended for decades. Before we have housing pods hanging from the old Bay Bridge span, can we possibly have Caltrain extended to the TTC like we were promised over a decade ago? Can we have travel between the Richmond and downtown reduced to 30 minutes? Can we improve MUNI headways, build a new BART tube, and focus attention on making transit connections more seamless? Thank you. minor correction; we were promised Caltrain to TTC over 25 years ago. Shows us where MTC’s priorities are. The idea is to integrate modern windmills, photo-voltaics, and other renewable energy technologies into parks and other urban spaces. Heavy rains, floods, forest fires, sea level rise are the new normal, warned the Union of Concerned Scientists at SPUR. And it's only going to get worse. What can local and state governments do?